This mile-long, crescent-shaped beach, also known as Playa Blanca (White Beach), is as beautiful as any of the famed beaches in Costa Rica. 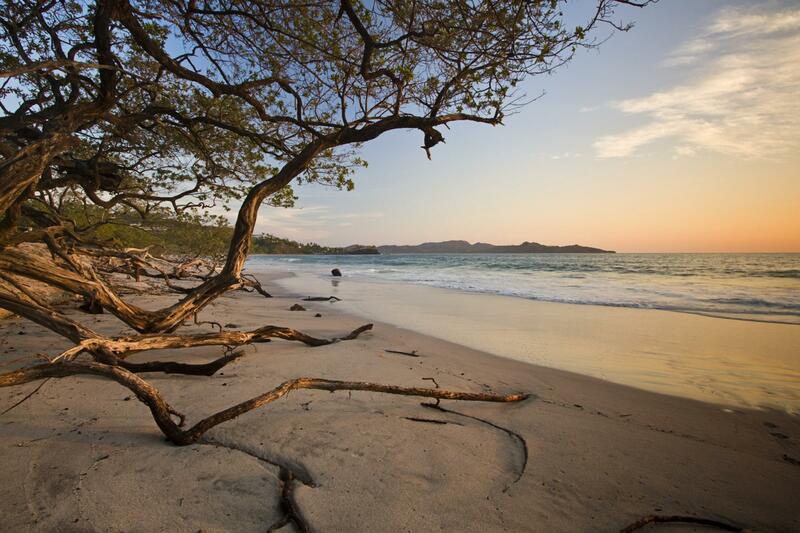 Among the first of Costa Rica's beaches to receive international attention, Flamingo Beach has evolved into one of the country's most lavish areas. Unlike many beach communities, Flamingo Beach has no village center. The community that extends east is home to exclusive beachfront Resorts and coveted private property. Thus, life beyond the beach and water sport activities is limited to a few excellent restaurants, and visitors seeking nightlife should head to the nearby town of Brasilito, or beyond. However, there are some family-friendly activities that will take you out to sea or nearby national park tours. As is the case with all Beaches in the Papagayo region, Flamingo Beach is rich in natural beauty. Mangroves are abundant in the area, and Salinas Point offers a stunning view of both the Potrero and Brasilito Bays. Not far south of Flamingo Beach is the Marino Las Baulas National Park (Parque Nacional Marino las Baulas). Established in 1990, this refuge encompasses roughly 450 hectares of coastline and mangrove swamp, and it is one of the world's most significant nesting sites for the endangered Leatherback Turtle. These giant, majestic creatures come ashore to nest between November and April. There is an informative turtle museum on site and night-tours are offered during nesting season. The park is also a great place to spot marine birds, including the White Ibis, the Blue-winged Teal, and the Muscovy Duck. Additionally it is home to monkeys, Coatis, and even crocodiles. Daniel Oduber Quiros International Airport offers seamless travel to the region, and Flamingo Beach can be access by way of a paved road. Alternatively, the smaller airport in Tamarindo receives domestic flights from around the country, and from this airport visitors are a short taxi or bus ride away from Flamingo Beach. From the capital of San Jose, however, the bus or car ride is about six hours along the Inter-American Highway. "The staff of the Yellow Fin boat were excellent! Very friendly and helpful and made our trip something special to remember!" The staff of the Yellow Fin boat were excellent! Very friendly and helpful and made our trip something special to remember! Playa Flamingo was beautiful. The beach was nice and not too crowded. Loved the water activities. Playa Flamingo is one of the smaller beaches and the town is also a bit small, which we liked. We liked the area in general. It's really just for laying on the beach and/or pool. There's a few "thrill" activities if you wish but little in the way of nature viewing. Still, it's a beautiful spot to unwind. We ate at the "Smokin' Pig" at Playa Potrero, which was excellent.